Mike Byers has published the newest quarterly edition of Mint Error News Magazine. 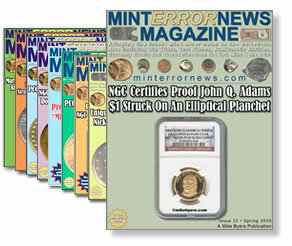 Issue #25 brings the very latest in mint error and variety coin news and information. As always, the magazine offers excellent photos that direct the reader right to the substance of coin errors. And the included error coin price guides compiled by Al Levy (alscoins.com) is a must have reference that provides a comprehensive listing of recent eBay closing prices with descriptions, grades and notes. The cover story for Issue #25 provides high resolution photos of the the latest known proof U.S. coin struck on an elliptical planchet — only three are now known to exist. The most recent is a NGC certified John Q. Adams Presidential $1 Coin. The second discovered was a Proof Jefferson Presidential $1 coin, which Byers showcased in Issue #23, and the first was a proof Utah quarter. You can view the magazine and any back issues through the Mint Error News website. However, it’s always a good idea to simply download the magazine directly to your desktop so you have a fast, always-ready resource at your fingertips. A listing of the magazine’s table of contents provides a glimpse into the variety of errors, information and coin photos presented. CoinNews hosts “The Error Coin Price Guide” generously provided by minterrornews.com. By using the photo error coin guide, you can quickly find an error coin of interest, click its image and immediately go to the appropriate page with more information and prices. I have a 2007 james madison presidential gold dollar error. it is a blank planchet no mint marks or anything. I found it in a u.s. mint $25.00 roll of james madison gold coins, how much is this coin worth or has it been reported yet of this series? purchased it from the mint for myself. Any suggestion welcomed.